It was a nice day to take the lower level outside and transfer the track plan. 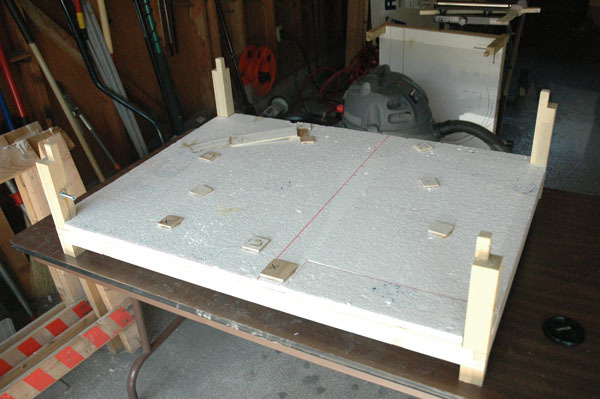 After the box frames were built and topped with 1/4″ plywood, I started in on building up the lower level. Because of the limited vertical space between the levels, I limited the thickness of the foam layer on top of the plywood to 1/2″, using a Styrofoam sheet product I found at Lowe’s. This type of Styrofoam is not ideal (I prefer denser foams) but its what I could get cheaply in 1/2″ thickness. I’m using the Woodland Scenics foam pencils that work great on dense foams. This large cell Styrofoam is fairly soft so you have to use a light touch with the pencils or you’ll end up with grooves instead of lines. Is a Plan Ever Done? 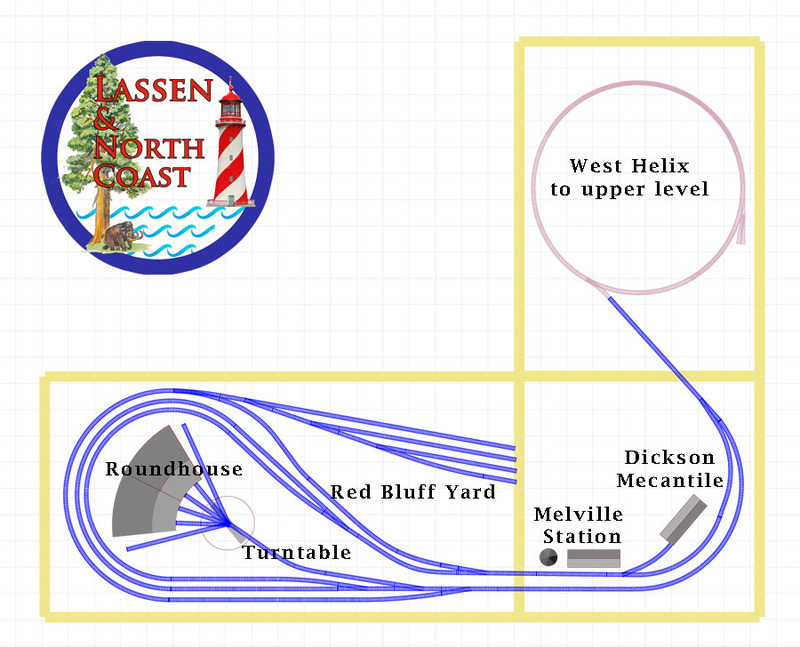 It shouldn’t surprise anyone that I’ve been tinkering with the track plan. Since I first transferred the track plan to the lower level, I’ve added additional storage / sorting tracks at the Red Bluff Yard (I’ll draw that in before laying the roadbed). At Melville I added a short branch track to serve a local merchant; I have a neat little covered depot kit I intend to use for that feature. 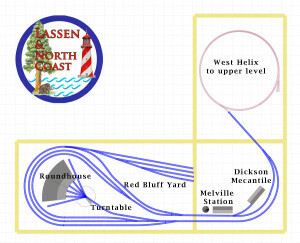 As you can see from the actual module above, the Roundhouse and turntable in the drawing don’t accurately represent the arrangement. The roundhouse I rebuilt is designed for a much larger turntable than the one shown in the drawing — 120 scale feet. There was no upside in trying to accurately draw it in CadRail, so I used a library object as a placeholder. 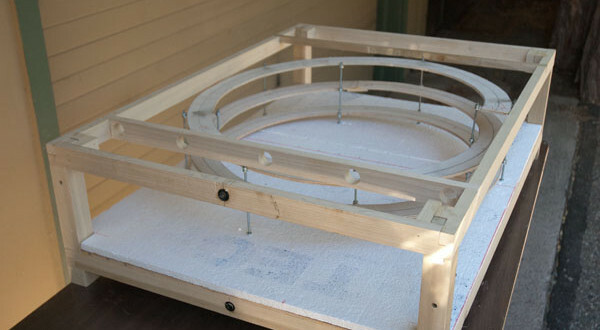 The library object is a roundhouse / 75′ turntable combination. The lower level of the middle module has only a little track. 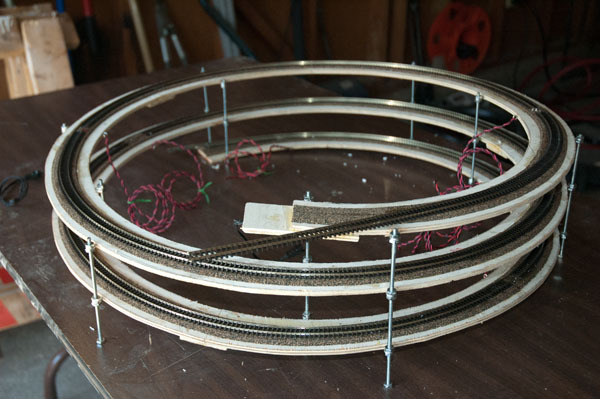 The spiral intersection of the two tracks isn’t right yet. After drawing the lower level track plan on the foam on the left and middle modules, I turned my attention to the third module. That one contains the West Helix. Not much to draw on the foam. Not much, that is, except the critical diagonal tangent from the helix to the curves on the adjoining module. I couldn’t draw in final track lines without having the helix ready. The helix is the primary feature of the lower level. 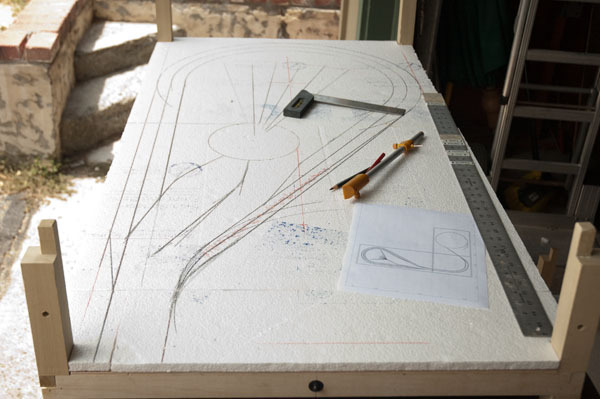 It was designed to fit the space tightly to accommodate a 12″ radius curve, so it made sense to build the helix first and fit everything else to it. The helix basic structure. Those rods will poke your eye out if you aren’t careful! I cut off the excess at the first opportunity. 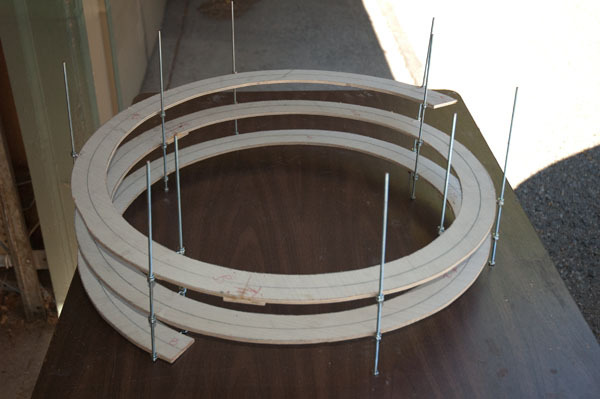 I made the helix from a set of arcs, 2″ wide with a 12″ radius center line, cut from 1/4″ plywood. Each arc is 240 degrees, or 2/3 of a circle. 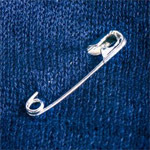 This kept the number of joints down and made sure they were staggered. Using plywood plates to join adjacent arcs, I put enough together to make the helix. 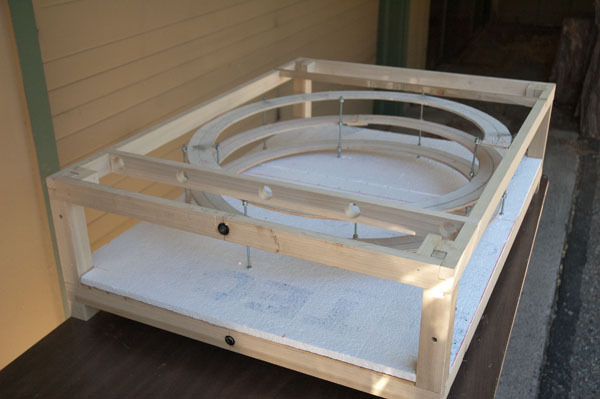 When the glue was dry, I screwed eyelets into the sides of the plywood ramp, inserted 1/4″ threaded rods to act as supports, then raised the helix using nuts to hold the eyelets in place. You can see the result above. When I was satisfied with the positioning of the ramp, I froze the nuts in place with a little CA. Final fitting required having the top section in place. Fitting the helix between the two levels of module 3. While fitting the helix, if found that the softness of the Styrofoam the helix supports were resting on was going to be a problem. I had been thinking the nuts at the bottom of the rods would spread the load sufficiently, but that proved not to be the case. My solution was to glue little plywood pads in the places where support rods would contact the lower level. I also glued in a transitional ramp to connect the bottom of the helix to the lower level track. Pads for support rods, plus the connecting ramp for the bottom of the helix. With the support in place and the helix fitted, I decided to go ahead and lay the track so that the helix was completely ready to go. 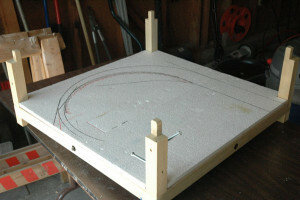 Having the helix as a free standing object made access and track laying so much easier than it might have been. I added feeders every 18″ or so. The whole helix will be a single block and the last thing I want is power problems! 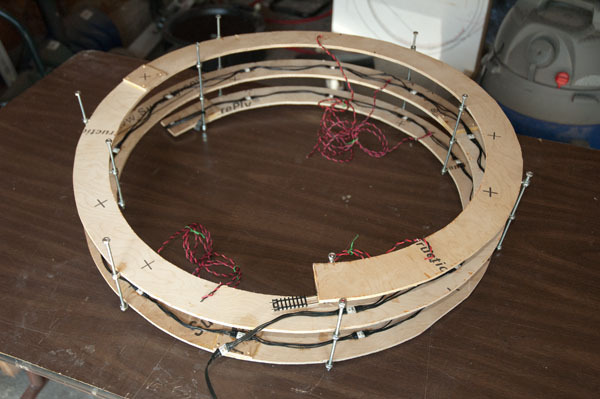 While I was at it, I fastened a string of addressable RGB LEDS to the underside of the plywood, spaced at 6″ intervals, so that the helix can be lighted. Helix with track, ready for use. After thoroughly cleaning the track I tested a locomotive on the helix and it ran well, so I’m confident the helix ready. Now I can finish drawing in the lower level track and move construction on to the next phase. This entry was posted in Construction, Materials, Planning, Uncategorized and tagged benchwork, helix.